Well it's that time of year again. In the spring and fall there is a Car Show the biggest one in the Northeast part of the United States of America. The car show is in Carlisle Pennsylvania just outside of Harrisburg. We have gone there a few times before, and my husband has gone many times. We loaded up the camper and drove on down to Carlisle on a Friday. I guess the car show had been in full swing for a little bit by the time we arrived. We parked in a grassy field across from the fairgrounds and camped there. The area that the car show is in is enormous. Not to mention it is very hilly. You will see vendor after vendor after vendor there. There are grandstands there and across from the grandstands are three cars they give away each big show. These cars in my opinion weren't that great this time. Would you believe one was a Ford Pinto, weren't those fire hazards ready to go off in rear end collisions if I remember right. I think they might have had some type of major problem on impact. There were also a lot of great cars for sale there. Ranging from Low Riders, Hot Rods, Muscle Cars, luxury Cars and much more. Back to the vendors which was why we went, although I wish I had money to buy one of those sweet cars that was there for sale. The vendors ranged so much in product it was incredible as always. There were professional vendors there, selling car products under big tents, like you'd see at a race track or other car event. There were people selling parts and some of the parts were big, like engines, transmission, front ends of cars, seats and more. Those parts guys were selling too. There were paper vendors although not a lot, people selling ads, postcards, car manuals, signs and more. There were people selling jackets, some of those were nice, toys, Hess Trucks that people collect, tires, rims, car emblems, hood ornaments and food, lots of food. 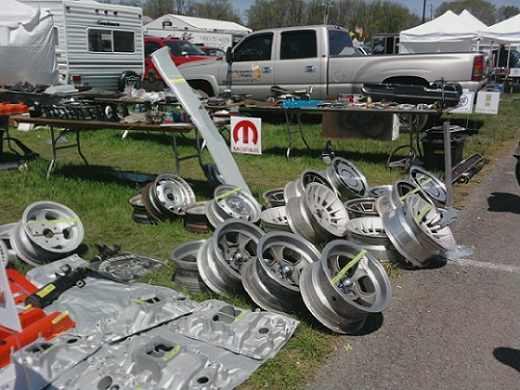 I think anything anyone would possibly want to buy at a car show, you'd find it there, there was stuff upon stuff and row after row of more stuff. Here is a picture of some stuff as an example. We were just looking for car brochures, the older the better, hopefully from the 1960's and 1970's or even antique car brochures from the 1930's or 1940's. We prefer the vintage muscle car type car brochures the best, first because we know something about those cars, but we grew up with the muscle cars and it brings back memories too. My husband and son went in the early morning and the daughter and I stayed behind to rest from the drive the day before, plus it was a little chilly out. They came back with some bags so we knew they found something. My husband found a guy selling car brochures, so he asked how much for the car brochures, and then he just asked how much for the whole lot of them. It's easier than counting and you can usually get a good deal on a big group of things. So I guess they came to a mutual agreement on a price and he bought a bunch of vintage 1960's and 1970's car brochures and there was also some great dealer information pamphlets that according to my husband are very rare. He did a search online for them and couldn't really find anyone that had them, so I've already started scanning them to get them ready to go on the website for your viewing I hope. My daughter and I went back with the boys later that morning and walked and walked and ate and walked, but never really found much more as far as car collectible literature, so after looking at the great cars that were for sale again, we left, and hit a Pennsylvania State Park for a relaxing little bit of camping before heading home. It was tiring but fun. 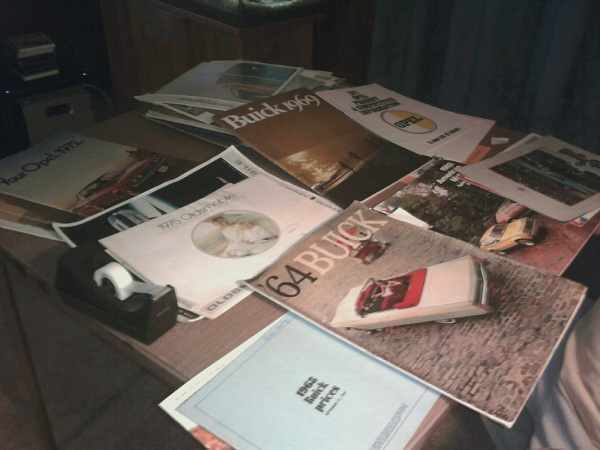 Here is a picture of some of the vintage car brochures that my husband found.